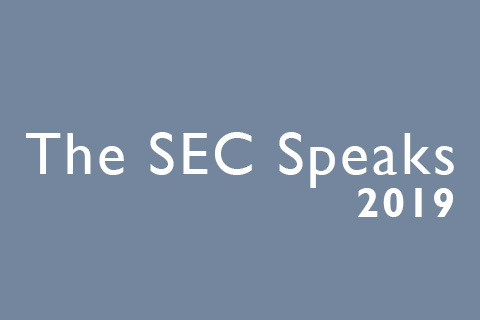 Last week, FRA Associate Director Mihnea Rotariu attended The SEC Speaks in 2019 conference in Washington, DC in cooperation with PLI and the US Securities and Exchange Commission. The program provided an essential update on the current initiatives at the Commission, as well as the priorities of the Commission for the coming year. Below are some of his key insights from the event. Daniel S. Kahl, Co-Deputy Director and Chief Counsel, Office of Compliance Inspections and Examinations (OCIE) addressed challenges presented by EU’s General Data Protection Regulation (GDPR) for Dual registrants. The SEC is working through issues with EU counterparts on how examinations can be conducted. Mr. Kahn gave the example of an EU investment manager that is investigated of favoritism, where OCIE would need to look at the individual transaction and personally identifiable information (PII) data in order to determine the veracity of the allegations. According to Mr. Kahl, Brexit creates additional challenges, as most dual registrants are based in the United Kingdom. Commissioner Roisman’s remarks focused on Encouraging Smaller Entrants to Our Capital Markets. The panel commented on how the Supreme Court’s Lorenzo decision extends securities fraud liability to those who disseminate false statements made by others or direct others to make false statements. Marc P. Berger, Regional Director, NYRO, talked about the Gladius case. Gladius conducted an ICO in late 2017. Gladius self-reported to the SEC, expressed an interest in taking prompt remedial steps, and cooperated with the investigation substantially. The SEC did not impose a penalty because the company self-reported the conduct, agreed to compensate investors, and will register the tokens as a class of securities. Mr. Berger, further stated that cooperation can take many forms, but in practice cooperation “helps close investigations faster”, is done in a timely manner and is proactive. Companies need to maintain a good relation with the SEC staff and be “forthright”. Anita B. Bandy, Associate Director, Home Office stated that she is very mindful of privilege concerns and that a waiver is not necessary for cooperation credit, and that the staff will not deduct points for a failure to waive. • How widespread is the conduct? • How high up in the organization does the conduct go? • How long has the conduct been going on? • What is the compliance environment? • How efficient is the remediation? Does it prevent the conduct to go further? For how long have the new policies and controls been in place? What objective data is available to confirm? • Has enough time passed to think that the conduct will not repeat? Ms. Bandy further stated that this is “not a cookie cutter approach”. Typically if the SEC is involved in the investigation at the onset there will be a correlation in the resolution. Certain parties choose to split up regulators, this practice do not help having a joint resolution. Stephanie Avakian, Co-Director, Steven R. Peikin, Co-Director and Joseph K. Brenner, Chief Counsel touched Wells submissions and stated that “brevity is key” and that counsel should not try to fit 60 pages in 40 pages by reducing fonts, margins and paragraph spacing. Counsel should be realistic in assessing the goals of the submission and the nature of relief that may be achieved. According to the Panel, Wells submissions should not cover all the points in the action, as they tend to lose focus and result in loss of credibility by the SEC staff. The panel also agreed that pre-Wells submissions are acceptable and even recommended for certain cases. Expert reports supporting a Wells submission are very “effective and powerful” if they are of good quality. The Panel sees that expert reports prepared for litigation tend to be less detailed and are not effective. Ms. Miller is the Advocate for Small Business Capital Formation and in her remarks she stated that the office’s business plan sets forth a pragmatic approach to deliver on Congress’s charge. “Specifically, it means approaching problems with a solution-oriented mindset and making practical recommendations for meaningful policy advancement”. The Small Business Capital Formations has been in operation for just over two months and currently has three staff.